CTRThemePlus is the most recommended Responsive Adsense Ready WordPress Theme. Do you know, Google AdSense has guidelines and recommendations for Ad placements. And, not every WordPress theme follows or is built to place ads. But CTRThemePlus does follow all these guidelines to get you high CTR for your WordPress Site. To get high Click Through Rates (CTR), it is recommended to use CTRThemePlus. 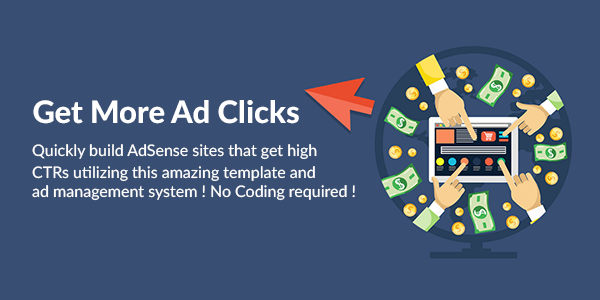 CTRThemePlus is the ultimate WordPress AdSense Ready Theme which will get you more Ad clicks. And, more high CTR means more income. CTRThemePlus (for WordPress) makes it easy to build informational websites monetized with AdSense that get awesome (HIGH) click-through rates (CTR). 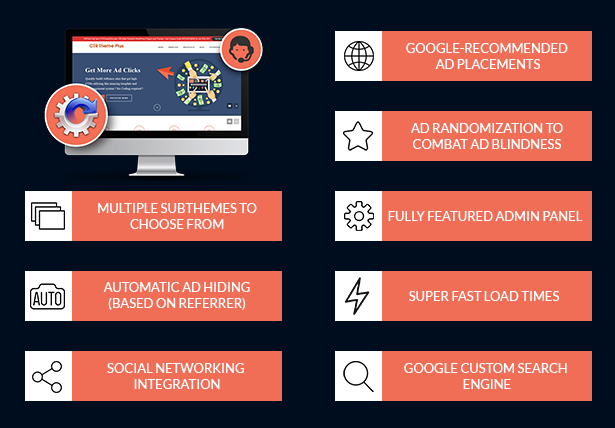 CTRThemePlus comes with its ad management system which allows you to display ads where you get the most eyeballs. Google AdSense provides hands-off recurring income, but usually, sites running the AdSense program leave a lot of money on the table by having bad designs or under-optimized ad placements, which is where CTRThemePlus can help. CTRThemePlus, one of the best Responsive AdSense Optimized WordPress themes around, makes it simple to turn almost any niche into a winner in just a few seconds. Google AdSense has some recommendations for ad placements for high visibility and clicks through rates. CTRThemePlus implements all the Google recommended ad placements in it. Let CTRThemePlus the best Responsive Google AdSense WordPress Theme be your income generator. Ad randomization is a great way to combat ad blindness. Google also recommends that the position of ads should be changed frequently. It will also make sure that the visitor sees a different ad every time. CTRThemePlus allows you to randomize your ads with just a click of a button. Minimize ad blindness with CTRThemePlus. CTRThemePlus has a user-friendly admin panel which reduces time in searching for specific ads like other themes. You don't have to mess around with theme files or hunting for the right plugin to place your AdSense code or even to adjust theme settings. Website load time is considered a huge ranking factor. Now, Google even displays on the SERP pages that the website is slow to load. But, you don't have to worry about it. CTRThemePlus is fully optimized for super fast loading times. This also helps in reducing bounce rates among visitors. Automatic Ad Hiding allows you to block ads to users who have come from a certain domain. For affiliate sites, this is a bonus. You can block ads to who you refer. Social networking is a staple these days. To promote your site social media, we have integrated social networking with CTRThemePlus. Over 13 social media platforms like Google+, Facebook, Twitter, Youtube can be integrated easily. Do you know, Google custom search engine could also improve your AdSense money? Well, CTRThemePlus won't disappoint you there either. Using CTR Google Search widgets, you can create a custom search engine with AdSense integrated on it. Make money on AdSense on search results. CTRThemePlus includes multiple sub-themes which you can use. All the themes are fully responsive and are designed in a way to highlight ads and to maximize click-through rates. You don't have to look any further than CTRThemePlus. Now, display ads on your AMP pages. With the CTRTheme AMP Addon, you need to add a code simply and you will have ads on your AMP pages. Click here for more details. So wish to get High CTR for your WordPress Site? CTRThemePlus Responsive Google Adsense Ready WordPress Theme is the most suitable solution for your requirements.